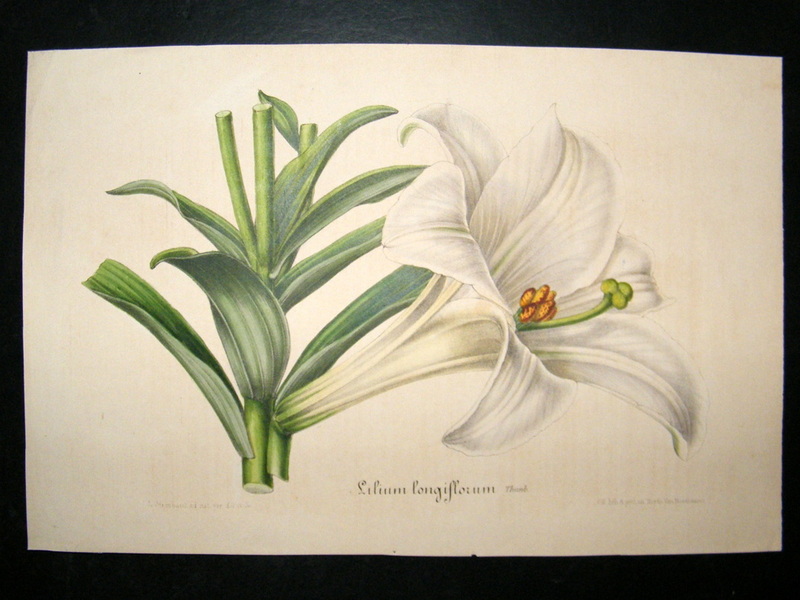 The Easter lily has large, white, trumpet-shaped flowers that triumphantly announce the arrival of spring. It’s a gorgeous ornamental, a potent ancient symbol, as well as a traditional food and medicine. 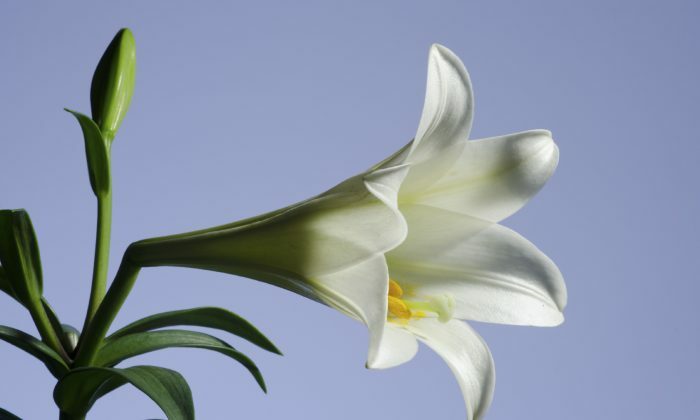 The lily is an important symbol to Christians because its spring bloom symbolizes the resurrection of Jesus. But in older cultures, lilies were associated with female gods, such as Hera, Juno, and Venus. In ancient Mesopotamia, the lily was linked with Ishtar, a goddess who embodied both creation and destruction (fertility and war). 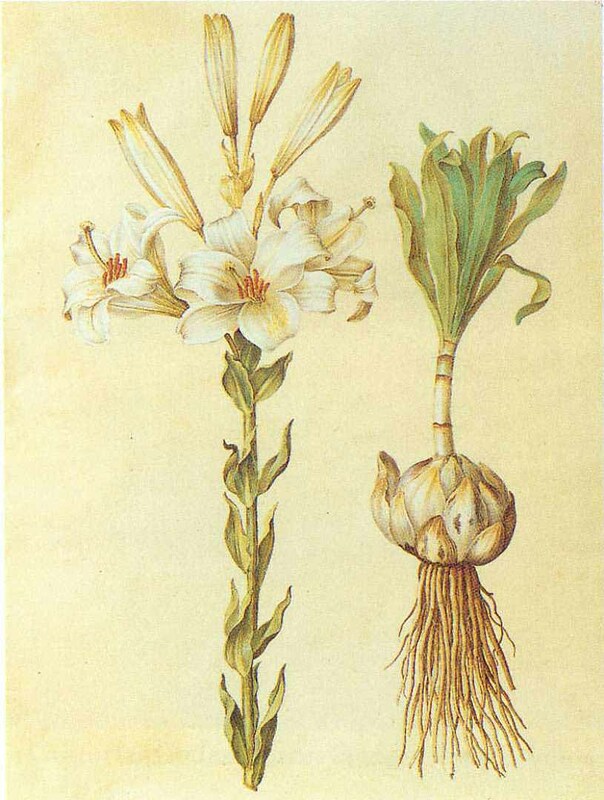 Western folk medicine considers the white lily bulb a remedy for a wide variety of ailments: edema, tumors, burns, and tendonitis. Many types of lilies are found all over the world—onions, garlic, and aloe are all lily relatives (known collectively as the allium family). The Madonna lily—a close relative of Easter lily—has been cultivated in the Middle East for over 5,000 years. What we call the Easter lily (Lilium longiflorum) is actually a native of the Ryukyu Islands of southern Japan. These plants have been cultivated in Bermuda since the 1800s, so they’re sometimes called Bermuda lily. Western folk medicine considers the white lily bulb a remedy for a wide variety of ailments: edema, tumors, burns, and tendonitis. But its most common use is as a medicine for distinctly female issues. It is used to restore fertility and to rid the body of cysts in the ovaries, breasts, and skin. 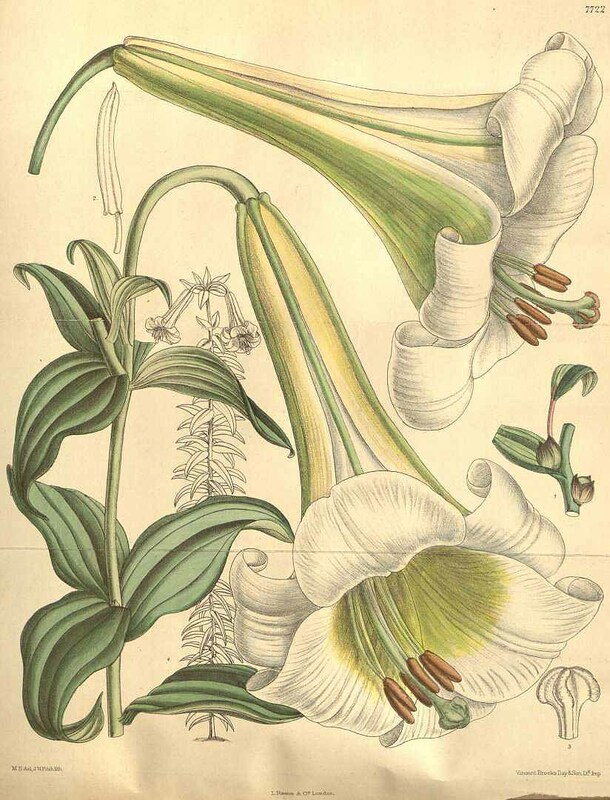 The 17th century herbalist and astrologer Nicholas Culpepper identified the lily as a remedy for “swellings in the privities.” Contemporary herbalist Matthew Wood agrees. In his 2008 “The Earthwise Herbal,” Wood notes cases of ovarian cysts resolved with Easter lily use, as well as cases of reversing infertility and bringing ease to labor and periods. Instead of the bulb, Wood prefers to use an Easter lily flower-essence tincture with his patients. He prescribes it for issues both mental and physical. Similar species of white lilies grow throughout China. They are cultivated for their beautiful flower, as well as their bulbs. In Chinese medicine, the lily bulb embodies a yin nature, which means it has cool, moistening qualities. The Chinese name for lily is “bai he,” which means “hundred meetings”—a reference to the many layers that make up the lily bulb. The bulb is said to symbolize a strong, happy marriage. It also serves as a medicinal herb for insomnia, irritability, and bronchitis. In Chinese medicine, the lily bulb embodies a yin nature, which means it has cool, moistening qualities. These yin qualities are used to address imbalances in the heart and lungs. Traditional Chinese culture sees the heart as the house of the spirit, so lily is used not only to calm heart palpitations, but also to soothe a restless mind. Lily is a common Chinese herb for a chronic cough. When dry, irritated lungs start hacking up blood, it’s time to brew the lily bulb. Lily is also used as an expectorant for times when phlegm gets stuck in the lungs. Traditional Chinese cuisine considers lily bulb a food, much like its onion and garlic cousins. It is crisp and sweet and marries well in a stir-fry. Lily bulb is a very safe herb. It has received a class-one rating from the American Herbal Products Association due to its gentle nature. The long history of Chinese culture has shown that lily is safe enough to consume in food-size doses, but there are certain times when you should steer clear. For example, the lily bulb is not recommended for patients with severe diarrhea. It may make problems worse. Wood uses very small doses of flower-essence tincture: three drops, one to three times a day as needed. While lilies are safe for humans, they are extremely toxic to cats. If a cat eats any part of most lily species, it can be fatal.